A Yale astronomer peering deep into space one day with the Hubble Space Telescope spotted something interesting, and decided to take a closer look. 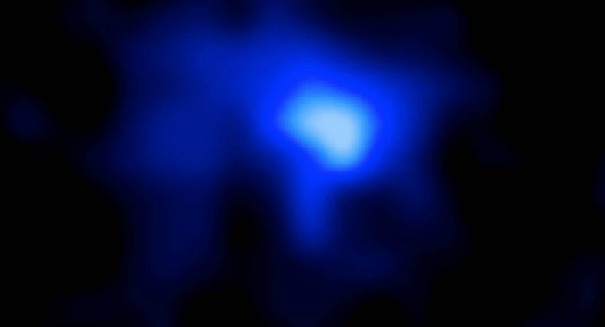 It’s a pretty amazing image: a blurry blue dot that scientists say is the farthest galaxy ever recorded at 13.1 billion light years away. It is one of the first galaxies ever created, and Yale and University of California Santa Cruz researchers had to use three telescopes in order to spot the fuzzy blue infant galaxy, as well as determine its true age, according to reports. They were able to figure out how old it was by measuring how its light shifts, and named it EGS-zs8-1. At that age, it is just 670 million years older than the Big Bang, a remarkable look back in time for scientists. The previous record was about 30 million years more recent, a rather small difference, but a tough record to crack nonetheless. To be more precise, the star is believed to be just 100 million years old. This would make it a very young and quickly growing galaxy that was probably in the midst of birth a tremendous amount of stars, a snapshot back in the early history of a galaxy that is certainly well matured by now. It’s difficult to say what this galaxy would look like as it actually exists today, 13.1 billion years ago, but the snapshot shows what the galaxy looked like during the early universe when galaxies and stars were just starting to form and the universe was a tiny fraction of the size that it is today. It is from the Bootes constellation, and the galaxy is larger than most of the others that were in existence during that time, enabling astronomers to spot it at all. The galaxy appears to be growing quite rapidly, creating new stars at an astonishing pace: 80 times the rate of our own Milky Way, according to reports. The galaxy was first spotted by a Yale astronomer in 2013 as he looked through Hubble Space Telescope pictures and noticed the bright object. Then he started going through Spitzer space telescope images, and finally confirmed its age and its distance from our planet with the ground-based Keck Observatory located in Hawaii, which enabled researchers to separate light waves. The Bootes constellation, where the galaxy is located, can be found in the northern sky, and its name comes from the Greek work for herdsman. It was first spotted by ancient 2nd century astronomer Ptolemy, who also spotted 47 other constellations. It is one of 88 modern constellations and includes the fourth brightest star in the entire sky, Arcturus. The astonishing age of 13.1 billion years takes it right up next to the creation of the entire universe with the Big Bang, which scientists believe took place 13.8 billion years ago. The Big Bang is the prevailing cosmological model for the earliest known periods of the universe, and holds that the universe was at an extreme density when it suddenly exploded and expanded, leading to the creation of everything from matter to the known laws of physics. The universe started to cool after this sudden expansion, which led to the formation of subatomic particles, and then atoms, which eventually through gravity formed stars and galaxies and eventually planets — and finally life. A light year is a tremendous distance that allows scientists to measure the vast expanses of space that could not be described with a measurement like miles or kilometers. A light year is estimated to be about 6 trillion miles, or 9 trillion kilometers. Essentially, it describes the distance that light would travel in a vacuum in one Julian year. Light travels at a speed of about 186,000 miles per second — which means a galaxy where it takes light 13.1 billion years to travel the distance to Earth must be very far away indeed. There are three kinds of galaxies: spiral, elliptical, and irregular. Spiral galaxies feature long, twisting arms where stars are formed, which are typically large and burn out quite quickly. Our Milky Way is a spiral galaxy. Elliptical galaxies tend to be very old, and they don’t create many new stars, with most of their stars being ones they’ve had for a long time. These galaxies are typically much smaller. The stars are more tightly packed in this type of galaxy. Irregular galaxies are simply any galaxy that doesn’t have a spiral or elliptical shape, and they can have many different appearances. Many of them probably used to be spiral or elliptical until something happened, such as a sudden merger with another galaxy.